Mohamed (name changed to protect his identity), 43, next to his tent in the Domiz refugee camp in the Kurdistan Region of Iraq. Mohamed, the imam of the camp's only mosque, fled his home in the Hassakeh Governorate of Syria and arrived in Iraq on 26 September 2012. After being warned that armed elements were searching for him, Mohamed got into a car with his wife and their six children and drove toward the Iraqi border. The family walked for two hours before crossing safely into Iraq and making their way to Domiz, where they were registered as refugees. 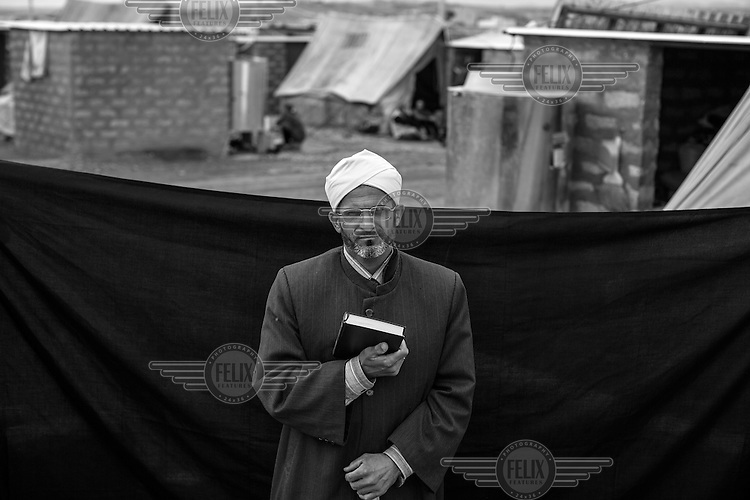 The most important thing Mohamed was able to bring with him is the Koran that he holds in this photograph. As an imam, he says that religion is the most important thing in his life. 'I love my religion, but I am not so strict in my views. I want to teach the importance of brotherhood and equality between all religions,' he says.